I saw a Tweet today from Tim Sweeney on computational optimization that sounded to me like something Josh might enjoy. But that got me thinking: totally separate from what Josh decides to do, what -- if you had the power to allocate his time post-LT -- would you like to see him work on? This is just a starter post; if there are some obvious ideas I missed, I'll re-build the poll options. Also, important note: this poll is for amusement purposes only, not to apply any form of pressure on Josh. So please don't go there. I personally think his next project should be to finish his degree in university, or perhaps to get a « formal » position in a software engineering company. I think this would help him getting structure and project management skills; today, I personally have not yet the impression that he can lead a project and deliver on time and budget. And he cannot plan his whole life with no salary during years waiting for a possible new game release N years down the road. I am old and conservative. I think Josh should work with a company developing cutting edge tools for improving the user experience on the PC. From overhauling Windows 10 GUI to making notepad look like a 2400 era command interface. Let flow the nodal interface as you browse your computer for items of particular file names. Edit the feel of the interface to fit your personal needs, and feel like you are living in the future. I still get a warm fuzzy feeling when MorrowJosh is mentioned. God i still dont get you guys' excitement with the nodal interface stuff. I agree with Corno, for any meaningful interaction it's useless. It may be somewhat useful to display deep objects like Goatbot's Global Goat object, but in any real circumstances (let's face it Goatbot is a mess of an "architecture") there is no call for a nodal interface. I certainly wouldn't waste time trying to change the mind of someone who has decided that an embryonic tech is completely useless. and I see what might become a tool with some utility for visually exploring large, complex datasets to reveal interesting/useful patterns. Could I be wrong about that? Sure. What's a good way to find out? How often do you actually need that capability? I havent said its useless, but its very far from an "ohmygosh its awesome! the be-all end-all interface solution!" Like I said, I could use this for Goatbot, but I seldom see datasets that are as... overly complicated as Goatbot has gotten. Goatbot, after all, was designed to break particular rules around separation of concerns and around data hierarchies. Mostly because I couldn't be bothered thinking my way around the correct methods at the time he was first written. Datasets that might make use of this are such like, filesystem architectures. And this structure was around LONG before Limit Theory stumbled onto it. 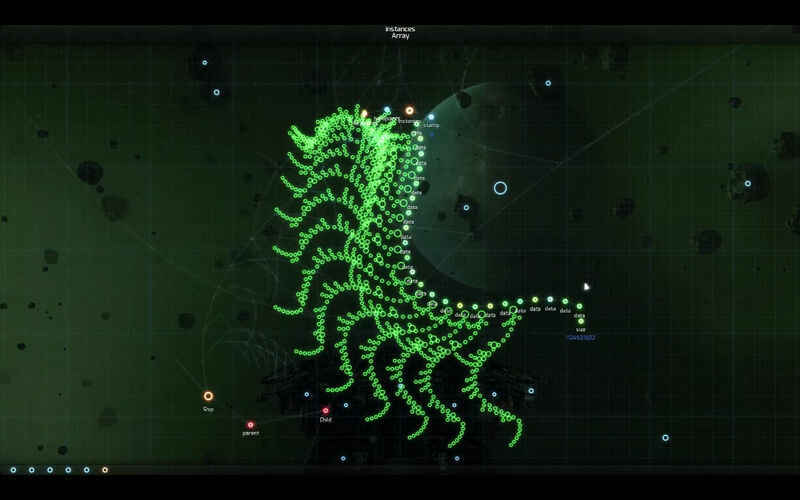 If you don't believe me, have a look at almost any codebase update visualization, the one I am thinking of in particular is the codebase for EVE Online. I voted for Morrowjosh. Of course I did. That's something else that's enthralled me since I saw it mentioned. I'd love for Josh to be able to do something like that. I'd probably follow along after him and "be all passionate" about that project and community too. You mean it's not already fantastical? Tal, REKT, at best, is Science Fantasy. It has space magic! Not really. In story, you're seeing the direct effect of universes with laws of physics differing from our own. More specifically, there are spacetime bubbles where the laws of alternate universes protrude into our own via different materials taken from those universes (and said spacetime bubbles can also be manufactured through certain high-energy processes). Not really "magic" at all - not perhaps hard sci-fi, but not remotely fantasy. If that's "at best science fantasy", then so are Mass Effect, Star Trek, and Firefly. Are they fantasy too?